There will be a contraflow in place near Aberdeen Airport this weekend. A contraflow is planned to be in place on the A96 near Aberdeen Airport this weekend from 8pm on Friday, June 9 to 6am on Monday, June 12, to undertake road pavement works, as part of the Aberdeen Western Peripheral Route / Balmedie to Tipperty (AWPR/B-T) project. Road users travelling east and west will use the westbound carriageway on Friday and part of Saturday. During Saturday road users will be transferred onto the eastbound carriageway. The eastbound carriageway will also be used by traffic on Sunday and Monday morning. Access routes to the Airport will be signposted. When the contraflow is in place on the westbound carriageway, access to and from the Airport will be via Dyce Drive only. Once the contraflow changes to the eastbound carriageway, road users travelling east along the A96 can use either the new airport link road via Craibstone Roundabout or Dyce Drive. 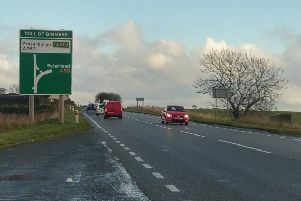 Road users heading west along the A96 from Aberdeen must use Dyce Drive. Road users coming from the airport and travelling west must also use Dyce Drive to join the A96. Road users intending to travel east along the A96 from the airport can use the airport link road to Craibstone Roundabout or Dyce Drive. A Transport Scotland spokesperson said: “This contraflow is necessary to enable the contractor to undertake pavement works on the A96 and associated road crossings, while enhancing the safety of road workers and road users. “We would like to encourage road users who need to travel through or nearby this area over this weekend to plan their journeys in advance, especially if they are travelling to Aberdeen Airport, so they can reach their destination safely and on time. “The contractor has been working closely with Police Scotland, Aberdeen International Airport and the local authorities to ensure that users of this key junction can safely complete their journeys while these works are underway. However, as with all changes to road layout, we advise road users to drive more cautiously than usual.